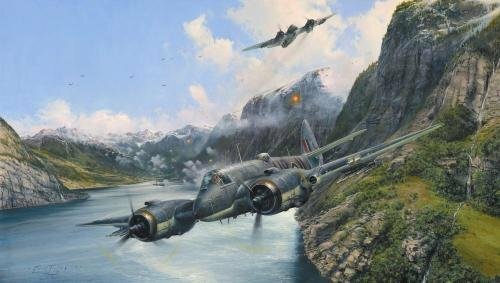 Robert Taylor’s gripping new painting conveys the awesome task faced by the Australian, British, Canadian, and New Zealand aircrews, as Beaufighters of No 455 Squadron RAAF from the Dallachy Strike Wing skim the rugged rock face, exiting the target after a successful rocket attack on shipping deep in a Norwegian fjord. THE RAF AIRCREW EDITION Every print in this new commemorative edition has been signed in pencil by THREE distinguished Beaufighter pilots who flew combat in the Strike Wings. Each print is also signed by artist Robert Taylor, and individually hand-numbered. THE VICTORY IN EUROPE EDITION Every print in this new commemorative edition has been signed in pencil by an additional four distinguished Beaufighter pilots. A total of SEVEN signatures in this edition.